The Pound erased some of its week’s gains on Friday after the February Markit Manufacturing PMI resulted at 52.0 as expected, down from the previous 52.6. The US Dollar's broad strength did the rest. On Friday, EU's Chief Negotiator Barnier said that the Union is ready to give the UK more guarantees that the Irish backstop is intended to be temporary, but clarified on Saturday that there won't be changes to it, neither will it be removed from the withdrawal agreement. Barnier added that he doesn't believe an agreement will be reached by March 29 suggesting that a "technical extension" may be needed. The possibility of a delay seems to be priced in, but the market still believes the UK will avoid a hard Brexit. Today, the UK Construction PMI is scheduled to be released later during the session. 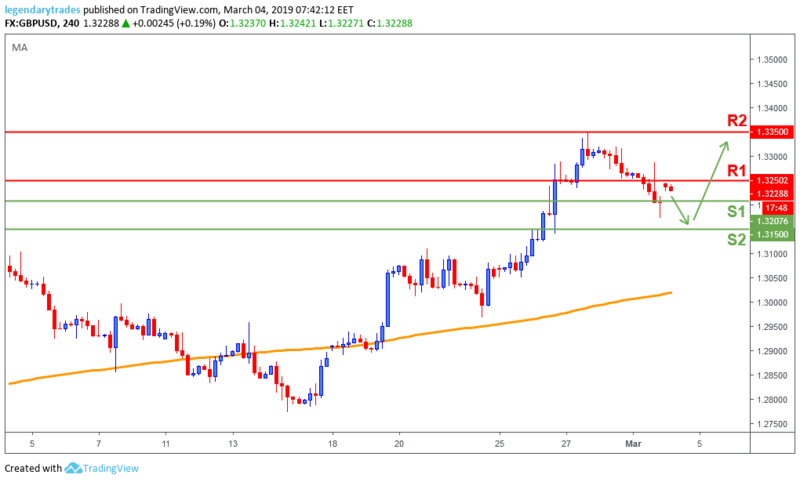 The Pound continued to pullback on Friday until it found a minor support at 1.3170s which pushed the price back up and closed at 1.32.The Sterling is currently in a correction territory, further weakness towards 1.3150 (S2) seem likely before the bulls step in and take price back up towards 1.33 highs.